Built and extended at the end of the 19th century/beginning of the 20th Century one of the outstanding early features of the church which is still evident are the beautiful stained glass windows at the front and rear of the church. 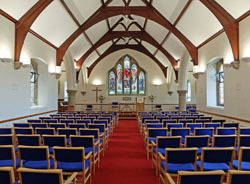 The church underwent a complete interior redesign in 2006 with chairs replacing pews, and a flexible communion area and new sound system installed. At the end of 2014 the sound system was completely updated and a new screen and projection system was installed. The church seats 150 people with a prayer space at the front of the church and a hall attached at the side. The church congregation is predominantly retired with a membership of about 80 and a regular morning congregation of between 50-60.